The setters in your vintage picture look exactly like my Rymans, Chester and Ollie. 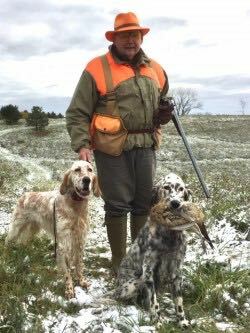 Here we are hunting pheasants in Canada in October. Nice pic, great looking Setters. Drop dead gorgeous setters. It would be satisfying to hunt over such an elegant brace. Beautiful Rymans! I had two named “ Westley & Richards “ that looked identical to these two!